Just Canceled! May 12-16 Open!! Cute & Affordable * Perfect For Beach Getaway! We are so glad you found our place. We want you to be happy by looking forward to this vacation Gulf Shores is a great place to come for a vacation. I think everyone loves coming to the beach and we have tried to provide a condo at a great price throughout the year. Our goal was to make our condo just the way we would like it to be when we are on vacation. We changed the colors inside to a soothing and refreshing color along with new granite and other goodies. Of course you want your vacation home away from home to be fun but you also want it to comfortable like home. We have accomplished that by using up to date furnishings and completely furnishing it so you don’t have to bring your whole house with you. We have just had our complex painted outside to a fun beach color. Lisa and I are almost fanatic when it comes to cleanliness. We make sure that everyone who comes to our condo are happy the moment they walk inside to see how clean everything is. Since we do our own cleaning we try not to miss a thing. I think everyone has stayed somewhere before when it wasn’t as clean as it should be so we are absolutely determined that you will never say that about our condo. We are located only 3/8th of a mile from the main intersection at the end of Hwy 59 where the public beach and The Hangout is. That puts us in a super convenient area for walking on wide sidewalks to restaurants, shopping and other forms of entertainment. If you have heard of The Hangout then we are just down the street a little over ¼ mile away. The popular Sea-n-Suds on a pier is right across the street from our complex. Wide walking, running or biking lanes & new sidewalks along Beach Blvd make it safe to go where you want by foot. That’s why we love our location. Gulf Shores is just south of Foley, AL about 6 miles and if you like to shop there is the Tanger Outlet with about 150 stores. All the chain restaurants are in Foley. Gulf Shores has the local flavored restaurants like Lulu’s, The Original Oyster House, Tacky Jack’s, Bahama Bob’s, The Shrimp Basket, Ribs & Reds, The Islander. The bottom line is that we have the most beautiful, blindingly white beaches in the world. 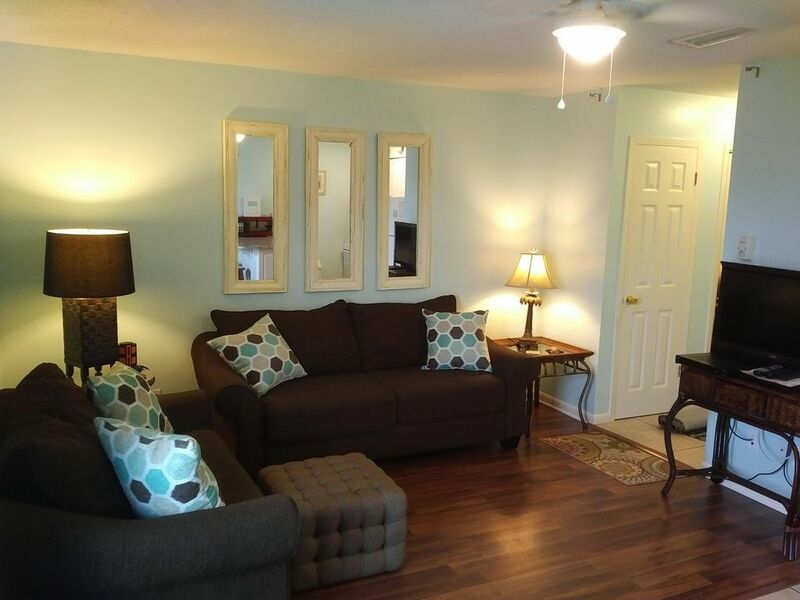 We hope you will want to consider our condo for your next visit. Check out our many guest reviews on this site to see what others have had to say about us. Lisa and I thank you all for looking at our website. I’m not sure you can call us a success story but if working very hard to establish ourselves in the vacation market is success then we’ll take it. Both Lisa and I have worked full-time jobs in Mobile, AL while working our beach condo business at nights, weekends and any other time people need us. This really all started very simply for us in realizing a dream of buying a simple, humble condo in Gulf Shores. After going to the beach on vacations most of our lives we finally could say we had our own place to go to. We started renting out our condo and found there were people everywhere that want to come to the beach but were priced-out just like it was for us. Our first condo provided a way to come and not spend thousands to do it. Lisa and I are the parents of a son, Nicholas, and a daughter named Jill. Jill thought so much of her parents that she has given us 2 granddaughters. It has added so much to our lives. We still live in Mobile and wear out I-10 and the Baldwin Beach Express going between Gulf Shores and home. We manage our own condos and help several friends with theirs. We do the majority of all the cleaning so that we can keep close tabs on each property and keep providing that personal touch. We aren’t a large or faceless company. We are people like you. Hard working people. We probably have many of the same problems but many of the same joys that you have. We are family people and connect well with the many families that come to our places here in Gulf Shores. We really appreciate each and every one of you that take the time to check us out. And we’d love to have you get a sense of what we feel whenever we are at the beach. Gulf Shores has always been our favorite place to go to. For many years we would come here on vacation and wished we could own a place here. Then we moved to Mobile and made the big move to buy a condo. Then one year later we couldn't resist it and bought a second one in the same complex. We must be crazy but we love it. Our condos are close to everything. You can walk to many things. Of course we hope you are coming for the beach. Our beaches are the prettiest beaches anywhere in the United States. Uniquely, we are hoping you have saved enough money on rent that you will have money left over for fun, eating andoii shopping. The beach is free. Walking and running are free. Everything else costs. Have fun in Gulf Shores! Coin-operated Washers & Dryers are located downstairs in a laundry room. You are provided keys for this room. We loved our condo! Had everything we needed for a week stay for my husband and I and our 2 kids! Its right next to a store that has a lot of essentials and perfect because it's a walk across the street to the beach! We really enjoyed our stay and had no issues with anything! The condo was very homey. Clean and comfortable. Will definitely be back. The owner was super nice. We enjoyed another vacation at one of Randy and Lisa's Gulf Shores condos. The condo was cozy and EXCEPTIONALLY clean. The kitchen was equipped with everything we needed to prepare and enjoy meals. The beds were very comfortable. We appreciated the condo location which was within walking distance of the beach, shopping, and restaurants. As always, we received excellent service from Randy and Lisa. One evening, we had a question related to the condo and Randy responded immediately! We hope to enjoy future vacations at Gulf Shores and we definitely would choose to stay at one of Randy and Lisa's condos. We had a great time! We enjoyed staying at your condo! It was very cozy! It was equipped with everything we needed. It was in a very convenient location! It was very close to the beach. I would love to stay there again and recommend it to anyone! Love the location and the cleanliness of the condo. We have stayed in this complex once before and appreciate the way Randy will work with you. After spending a week on the road and in hotels, it was great to have a homey place to put up our feet and relax and just not have to do anything or go anywhere. I did not have one bad night of sleep as the beds were as comfortable as my own bed. We hope to be back again soon and can stay in one of Randy's condos. Golf: Everything from championship to par 3 courses.